Downtrodden and suppressed for too long, Hirai Kaz' Pilot Syndicate is back in its 4th rebirth as Pilot Syndicate 4. We are currently recruiting from all platforms. Welcome to Pilot Syndicate 4. Pilot Syndicate was originally founded by Hirai Kaz in November 3299. Having been repressed for a number of years, and moved on from one Alliance to the next, the Pilot Syndicate has risen again! 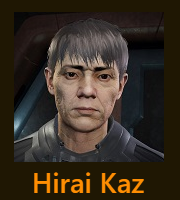 Now that Hirai Kaz has been pardoned by the Empire, we are searching for a new system to settle in.